Esurance's Nancy Abraham with the very likeable Dennis Quaid. 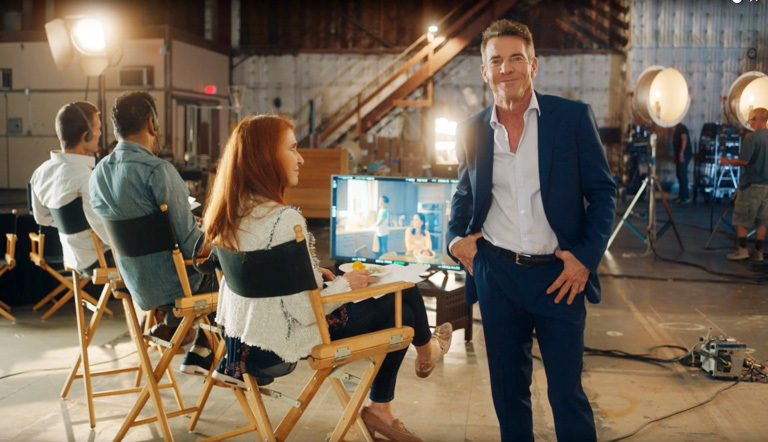 You’ve no doubt seen the new Esurance television campaign – “Surprisingly Painless” -- where Dennis Quaid discusses the benefits of purchasing insurance from the company. In one commercial, Quaid ends by saying that, if you don’t believe him, you can believe this real-life Esurance employee who he introduces -- Nancy Abraham. 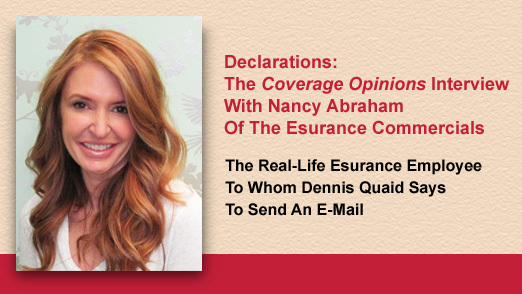 Quaid invites viewers to send her an email at Nancy@esurance.com. As an insurance enthusiast, with the inquisitive nature of Curious George, the chances of me not sending an email to Nancy Abraham were about the same as not eating a bowl of Jelly Bellies put in front of me. Lo and behold, Nancy Abraham is a real Esurance employee -- Vice President, Integrated Marketing Communications. And she was kind enough to answers my questions about the company’s new campaign, its decision to use Dennis Quaid as its spokesperson and having the actor invite millions of people to send her an email. I am a long-time student of insurance company commercials and the spokespeople/characters that they use to sell their products. [I once made a formal request to GEICO to interview the Gecko for Coverage Opinions. I swear. The company did not respond. The request probably never ever got past his handlers.] Having thought a lot about the subject, I give Esurance’s “Surprisingly Painless” campaign very high marks. Take Farmers Insurance. The company goes to highly dramatic lengths to explain that insurance pays money when things go wrong. If a hippopotamus escapes from the zoo, and steps on your Toyota, it’s covered. Good to know. Thanks, nerdy Farmers Guy. But I think most people are already familiar with the you-pay-us money, we-pay-you-if-something-bad-happens concept. The company is clearly doing something right. Of the nearly 7,500 customer reviews on Esurance’s website, 84% are five stars and 12% are four stars. But don’t listen to me. Here’s what Nancy Abraham, that real-life Esurance employee, has to say about the company’s new “Surprisingly Painless” ad campaign. Coverage Opinions: Insurers use a variety of approaches when selling auto and homeowners insurance to attempt to distinguish their policies from other companies. What made Esurance take the “surprisingly painless” approach? Nancy Abraham: We did a lot of research on how people feel about the insurance experience, and found that there are still quite a few pain points when it comes to buying, owning and using insurance. People think insurance is complicated, confusing and expensive. So, Esurance identified an opportunity to improve the customer experience. We’re on a journey to make insurance simple, transparent and affordable. In other words, surprisingly painless. This campaign isn’t just about finding a catchy marketing slogan, it’s our promise to address these pain points and improve the experience, and the entire company is working hard to live into that promise. CO: What are some things that Esurance does to attempt to achieve this painlessness? Buy – We’re streamlining the quote process so there’s more simplicity around getting the coverage that’s right for you. We’re also rewriting all of our coverage descriptions in laymen’s terms so they’re simple and easy to understand, making the buying experience very clear cut and transparent. Own – Our mobile app makes it easy for people to do almost anything, including file a claim, pay your bill, request a tow and access your insurance ID card, and we’re constantly optimizing that experience. We’ve also introduced more flexibility around when and how you pay us, so it becomes a much more painless experience. Use –Our photo claims tool allows you to file a claim by simply submitting a photo from your phone, so there’s no need to wait for a claims adjuster to come out and assess the damage. This greatly increases the speed and convenience of filing a claim. Another thing we’re doing is actually working with regulators to try to make more long-term changes in what we’re able to do for our customers. Insurance has been a certain way for 100 years, but we’re challenging regulators to look at things a little differently. The goal is to encourage a bit more flexibility in how we can engage with our customers, allowing us to further improve their experience. CO: What are some things that Esurance does to attempt to educate its customers? NA: We have a resource called Coverage Counselor which helps people understand what coverage is right for them. It’s a really simple way for people to feel more educated and confident that they’re properly protected. To make insurance more affordable we offer DriveSense, which is a mobile app that tracks your driving habits and rewards safe drivers with discounts on their premiums. The safer you drive the more you can save. But more importantly, it’s educating drivers on when they may be engaging in risky driving behavior, so they can improve. We’re not only there for you when something goes wrong, we also want to help people prevent things from going wrong in the first place, and becoming a safer driver helps protect yourself and everyone else on the road. CO: What made Esurance choose Dennis Quaid as its spokesperson? NA: We went through a very careful selection process and established criteria to pick the right spokesperson. We wanted an iconic actor who is both credible and authentic, and most importantly, recognized and liked by our target audience. We were also looking for someone who was famous for dramatic roles, but has a dry sense of humor and brings an earnestness that can be funny in ways that are surprising (which was key to the execution of this campaign); someone who is seasoned and confident and could effortlessly personify a challenger brand; someone people wouldn’t expect; and of course, someone who is highly likeable. Dennis Quaid checked all of these boxes. He was a natural choice, and the results have proven he was the right choice! Plus, he’s an Esurance customer! NA: I did love it! We really wanted to do something that would engage people and create an open dialogue with consumers so we could get real feedback on how we’re doing. We’re on a journey to make insurance surprisingly painless, and in order to truly be successful we need to be talking to people constantly. This was a unique way to engage people and build relationships, and it’s been well received. We’ve gotten thousands of emails and have been replying to all of them. The choice to have a real Esurance employee in the commercial was easy because we’re all about being transparent. So when Dennis says, “don’t believe me, ask a real Esurance employee,” you better believe you’re going to see a real Esurance employee! CO: What are some of your favorite emails received? NA: Well, I’ve received a few marriage proposals! But honestly, it’s been great to see the range of emails that have come in because it means people are excited to engage with us. I do love when people write in with questions about Esurance or how they can save, because it gives us an opportunity to educate them and help them feel more confident in their insurance decisions. It’s also been a great outlet for getting direct feedback on the progress we’re making to improve the customer experience. This opportunity to interact with more people further helps us make insurance simple, transparent and affordable for our customers. CO: Now that you’ve appeared on screen with Dennis Quaid have your turned all “Hollywood?” Sunglasses in the office? Telling people that they’ll have to talk to your people? NA: Not exactly. What’s been great about this whole experience is the fact that this ad has really resonated with people in a way we hadn’t expected. Yes, people always want to know if I’m a real person, but more importantly, people also really want to learn more about insurance, and this is a fun entry point for them to get that information. CO: Would Esurance be interested in purchasing one million copies of my book, “General Liability Insurance Coverage – Key Issues In Every State,” to send to its customers to further their education of insurance? I’m sure I can get you a volume discount. NA: Haha, thanks for the offer! We’re trying to keep things pretty simple and concise for our customers, but it sounds like an interesting read!